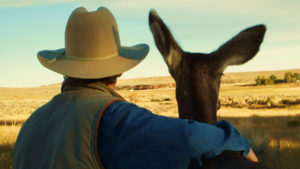 Joe Hutto’s idea of research is anything but normal, dedicating seven years of his life to becoming a wild mule deer. The herd would ordinarily run from any human but, incredibly, these keenly intelligent animals come to regard this stranger as one of their own. Accepted by the matriarch, he walks among them, is even groomed by them, and can lie with a pregnant doe talking to its unborn fawns. As he crosses the species divide, Joe is tapping into a new understanding about these elusive animals, literally entering a deer society. The captivating joy he feels for his new family is nothing short of infectious, but this human predator also learns to see the world from the point of view of prey – and it’s an experience that will ultimately rock him to his very core; sharing their world so personally finally takes a toll that sends him back to his own kind. On CPTV: Wednesday, May 31 at 8 p.m.